Born in Kelowna, BC on May 25,1936, Mum passed away April 4, 2019 surrounded by her family and friends. 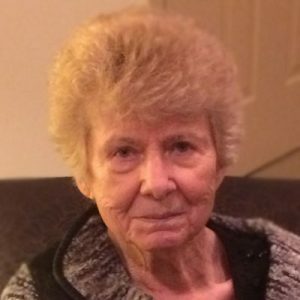 She is survived by her husband Henry; sons Tim and Ken; daughters Sheila and Kathy Kraft (Peter); sister Diane Fabian (Earl); and sister-in-law Pat Dulik (Den), all of Kelowna, BC. She was predeceased by her parents Martin and Mary Dulik; her son David and her two brothers Dave Dulik and Den Dulik. The Lord called Mum to her everlasting home. She will be loved always and forever. Prayers will be recited on Wednesday, April 10, 2019, at 6:00 pm and a Mass of Christian burial will be celebrated Thursday, April 11, 2019 at 9:00 am both at Corpus Christi Catholic Church, 750 Rutland Road North, Kelowna, BC. Interment to follow at Kelowna Memorial Park Cemetery. Special thank you to the caring staff and volunteers at the Central Okanagan Hospice House. In lieu of flowers, memorial donations may be made to the Central Okanagan Hospice House, 2035 Ethel Street, Kelowna, BC, V1Y 2Z6. The prayer service for JOHNSON, Doris Reba is scheduled for Wednesday, April 10, 2019, at 6:00 pm at located at 750 Rutland Road North, Kelowna, BC. The service for JOHNSON, Doris Reba is scheduled for Thursday, April 11, 2019 at 9:00 am. Below you will find the map for the service location and the contact information should you have any questions. My sincere condolences to the family. I am very sorry for your loss. Her legacy of goodness will live on through her children. She will be deeply missed.